INTERIOR OF ENGINE ROOM, BLOOMING MILL. 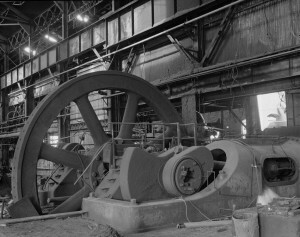 CRANK AND DIAMETER FLYWHEEL. 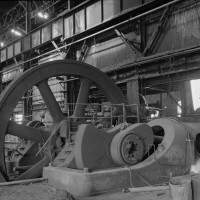 Republic Iron & Steel Company, Youngstown Works, Blooming Mill & Blooming Mill Engines. (1988) Courtesy of Library of Congress Prints and Photographs Division Washington, D.C. This entry was posted in Uncategorised on 15th February 2016 by Grainne Goodwin.